A Tooth - Three Roots - Charm Necklace - Brass Version by Defy. 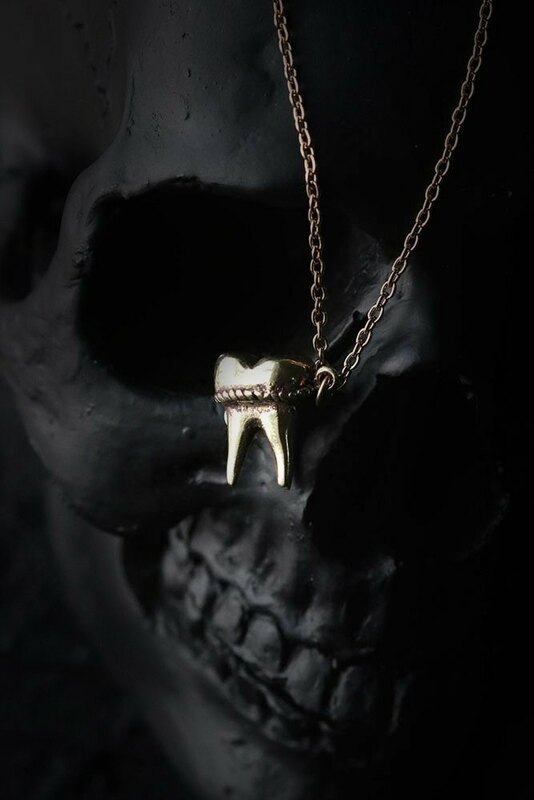 **A Tooth Charm Necklace - Three Roots Version - Defy in Brass Material from**A cool piece of a Tooth Necklace Charm from our Collections anatomical Teeth. The tooth is designed to have real anatomical look with the rope bind around. The tooth charm material is brass, and the chain is gold-plated, end with claw claps. - The tooth dimensions: approx. 1.6 x 1.2 cm. - The necklace chain length: Please choose from our option below. - The tooth is made of brass. The chain is gold-plated on brass. - Weight: 13 g. - Claw claps Shipping to World Wide - Please allow us to prepare the item and parcel between 1-3 working days. - All items will be sent by Thai Registered Airmail. The delivery usually takes about 10 - 15 working days for parcel to arrive in most countries. - Your item will come with our gift bag *** supply goods / products to Thailand.